Earlier this year I spent one month eating World War Two British style food; the basics provided on rations, plus fruit and vegetables in season. My aunt collaborated with me, providing her recollections of her childhood during those six years of war. I had such a great time with the experiment, and learned so much, that I decided it would be a good idea to repeat it four times in the year (April/July/October) using the fruits and vegetables specific to that season. What was it Robert Burns said? ‘The best laid schemes o’ mice an’ men gang aft a-gley’. I’m not sure what happened to my good intentions for April and July, but as we’re only ‘just’ into October I’m going to try to get back on track and start again on Monday, October 6th and continue through until Sunday, November 2nd. A little background to rationing in the UK during WW2 for those of you who are unfamiliar with its history. Even though people received ration cards entitling them to certain essential foods, and those foods were ‘theoretically’ available, it didn’t mean that they always received them. There were constant shortages. If eggs weren’t available one week, you didn’t get two the following week to make up, but I’m going to assume all the foods that were on ration ‘are’ available. This is what one week’s rations look like. 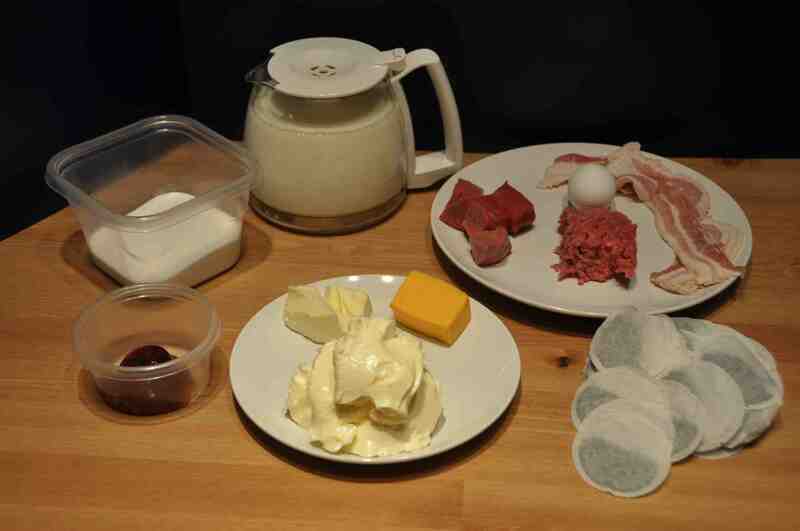 Fats – 8oz (2 oz butter, 4 oz margarine, 2oz lard). I’m going to substitute that with 8 oz of butter. As for the fruits and vegetables in season, I will be using those suggested on this website. For October that means: Apples, Blackberries, Sweetcorn, Savoy Cabbage, Kale, Red Cabbage, Squash, White Cabbage, Runner Beans, Potatoes, Brussel Sprouts, Spring Cabbage, Carrots, Maron, Spinach, Leeks, Celery, Cauliflower. Certain other foods weren’t rationed – eg flour, oatmeal – and others were to be found on a points system, eg tinned vegetables. No-one went into the war with empty cupboards, and I’m sure there were times people swapped – I’ll give you some extra sugar for a tin of peas – so I’m starting tomorrow with the following in my pantry cupboard; flour, raising agents, certain spices, raisins, a small tin of golden syrup and jar of mayonnaise. I call this my ‘Dining at the Savoy’ rule. Rationing was probably hardest on the housewife who remained in the home and was limited to eating only rationed food – unless she went out for a cup of tea and a bun, or the occasional fish and chips. People who worked in factories were provided with a daily hot meal at the works canteen. And of course, those who could afford it could always eat out, and eat out well – at places like The Savoy Hotel in London! – thus augmenting their rations. This month sees Canadian Thanksgiving and a Wedding Anniversary in our family. On those two occasions I’m going to adopt my Dining at the Savoy rule and not inflict my wartime rations on my relations! I’ve also decided to follow what happened in the newspapers between October 6th 1944 – November 2nd 1944, so will be adding information about that at the end of each post. And I still have a few questions I’d like to ask Anne who was a child growing up in Glasgow during that time. This entry was posted in Food, History, Wartime, Wartime Rationing and tagged Home Front, Second World War, World War Two, World War Two cooking, World War Two Rationing. Bookmark the permalink.